Please email your answer to administrator@ArkhamCity.co.uk. Please do not discuss answers in this topic. Thanks! 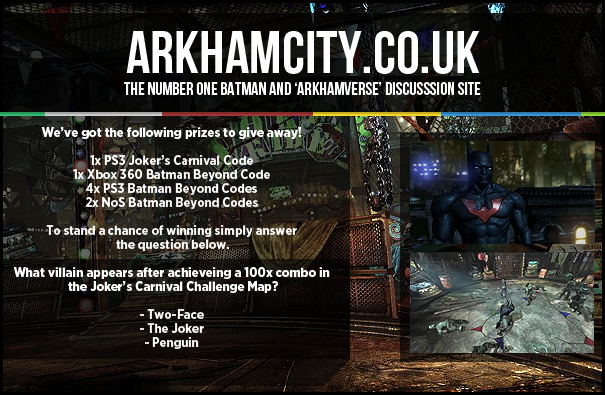 - You must be a member of ArkhamCity.co.uk to enter. - No entries are counted after 29th January. - Winners will be announced 3rd February. We'll be in touch within the hour! So keep an eye your emails. Oh, the email I used to send my answer is different to the one used with my account. Will this affect anything? Got all but joker carnival. Can't be bothered to send email. It's a very hard question, so I'm not going to enter, also I don't have XboxLive so I can't play DLCs. i'm sure most people on this forum have already bought all of the DLC but what the heck its christmas! oh and btw, where did you get all these codes? Also, if we have won, when will we know? I mean like, when is the competition over? I've sent my email with the answer and details but yeah, like the guy above me asked, when will we know who won the competition or when it is over? Ive already got the Jokers carnival but I would like the Batman Beyond skin. "Your mind will shatter like glass"
ive got all of the DLC's. 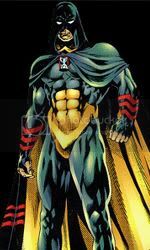 if you had more skins (TDKR or Earth One), then i wouldve gaven an answer. i played that map BILLIONS OF TIMES and still havent gotten 1st. IT SAYS DON'T SAY OR DISCUSS ANSWERS IN THE TOPIC! But come on, why not? Anyway, I may enter, it depends on whether or not I get PSN vouchers for Christmas. To enter or not to enter? I dont really need the Beyond skin haha Oh the joys of Xbox.